Restore balance to your complexion with Oxygen Botanicals Night Cream-Combination Oily Skin 1 oz. While you sleep this effective product creates the perfect balance between hydration and oil control with oil free moisturizers. Do not use if you have allergies to nuts or sulfur. Spot test before using. If an allergy does exist use Oxygen Botanicals Anti-Oxidant Cream or Specialty Cream B.
Oily problematic skin is effectively balanced as excess oil is absorbed, preventing clogged pores and breakouts. Wheat Germ oil gently hydrates as St. John's Wort acts as a powerful antioxidant. As you sleep your skin is protected, moisturized, and balanced. Bio-sulphur liquid helps in the absorption of excess oils. 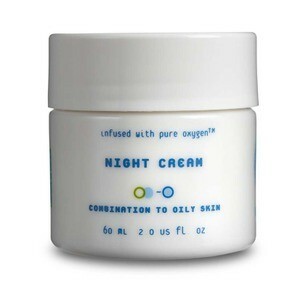 Oxygen Botanicals Night Cream-Combination Oily Skin 1 oz does the job for oily problematic skin. Your skin will emerge beautifully balanced and radiant. Start with clean skin. Follow with a toner and skin serum. Apply a thin layer of Oxygen Botanicals Night Cream-Combination to Oily Skin 1 oz to your face neck and decolletage area. Allow complete absorption of the cream. Use the cream every night before bed for best results.